Racing: Sunday July 1st (Canada Day) on Toronto's Centre Island (8am to 5pm). REGISTRATION IS NOW CLOSED as the team hit their capacity of 24 paddlers! This is the fifth anniversary year for this team, which was launched in celebration of WorldPride coming to Toronto in June 2014. What an amazing event for the LGBTTIQQ2SA community here in the Canada and around the world. We also participated in the WorldPride parade on a dragon boat float in 2014. We were also joined at the parade with the Canadian Breast Cancer Foundation. The plan in 2018 is to improve the recruiting, planning, coaching of the team, and add monthly video review! Last year, new graphics were designed for the team by Jayson Green. 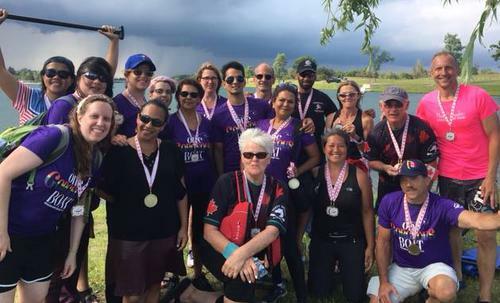 The team practices Sunday afternoons from mid-May to the end of June, and then race at the July 1st DDRA Canada Day Regatta on Toronto's Centre Island. The practices are located at the Balmy Beach Canoe Club on Ashbridges Bay. The non-profit program fee is $149 and registration is now open using the purple button below. No experience is necessary. ANYONE can participate in this sport, even if you have never been part of a team sport before. You will be surprised! This is why the sport is the fastest growing and most-inclusive sport in the world. l Dates: Sundays, 12:45-2:15pm, May 13 / 20 / 27, June 3 / 10 / 17 / 24.
l Location: Balmy Beach Canoe Club, at Coxwell and Lakeshore Blvd (see the Practice Site page). l Date: Sunday July 1st (Canada Day). The day starts at about 8:00am and ends about 5:00pm. Cost: $149 Payment via PayPal / Credit Card (using "buy this" button below), or Interac e-mail transfer to "Payments@RustyDragons.ca", or cheque to "Rusty Dragons Adventures" and mailed to Tim MacFarlane, 76 Brunswick Ave, Toronto, ON, M5S 2L7. Latest News (May 6th): Registration just closed, as the team hit their capacity of 24 paddlers. If you missed out, please check out Pink Crusaders and Harbord Village who are still recruiting. NEW in 2018: Monthly high quality video review of the team paddling on the water. This is a great tool to help improve your dragon boat stroke for both beginners, intermediate, and experienced paddlers. Notes on last few years (2016 and 2017): The team has performed very well at the OPS / DDRA Canada Day Regatta on July 1st on Toronto's Centre Island. Last year the team made the "A" Championship final. The year before, they competed in the "B" Division of the event and came 3rd place. The team had the privilege of being coached for the first two races of Canada Day each of those years by the one and only Jim Farintosh (former National team coach)! Registration Fee: $149 (Includes all practices and races, no taxes added). The use of our paddles and life jackets is included. 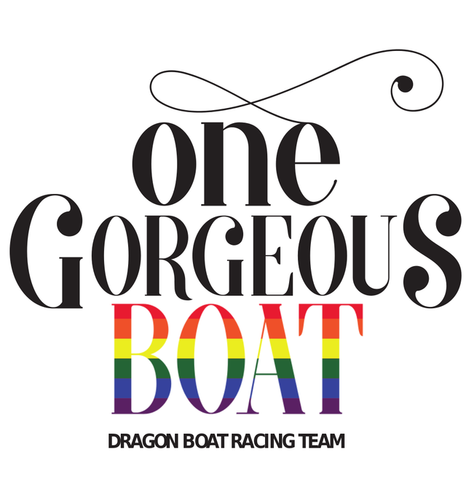 Click on the logo below to go to our FaceBook page, or search "Pride Dragon Boat" on FaceBook. "Like" us and show your support!